Yoga pants have become a hype in the world of fashion last few decades. Women wear them to hot yoga, restorative yoga, or just to hang out in something simple and comfy. The trend goes so far that they are actually drawing more attention to yoga than any other aspect of the practice itself. It might be the celebrities who have added new meaning to this everyday staple, spotted by the paparazzi in their super tight yoga pants everywhere from airports to sidewalks, and even Fashion Weeks. Or perhaps it’s the bunch of awesome Tumblr pictures of girls in tight yoga pants that make us think about our workout resolutions and healthy life goals anytime we see them online. Either way, yoga leggings are substantial part of our casual everyday outfits and are here to stay this spring too! We made a special selection of ten best pairs of leggings that are made with yogis in mind. Let’s have a look at the best Yoga Pants for the season, shall we? Body-skimming and figure flattering, these essential “Namaste” leggings are colorful, stretchy, super comfy, and made from high quality fabric that boasts “abrasion-resistant stretch,” full coverage and durability, so you can definitely get your sweat on in these pants. Yoga pants aren’t necessarily reserved for yoga classes. Sometimes they are about making a fashion statement — and a versatile pair of funky sugar skull leggings that you can wear from yoga to brunch are always handy when you run out of fashion outfits inspiration. Sometimes, yoga is about slowing down, taking a deep breath and giving your body time to rest. And when that time comes, you better believe you’ll want elastic and comfortable material on hand. These lightweight yoga pants are a great option for classes when you are about getting your meditation mood on. We are obsessed with the Gothic yet girly feel of our Sugar Skull and Roses Yoga Pants. These are not only ludicrously comfortable yoga pants, but they can make perfect feminine day of the dead leggings too. Because of their cool design and great versatility you can officially wear them to brunch, to a club, or whatever floats your boat. You don’t have to worry much about sweat when you wear the extra breathable Ornament Pattern Yoga Pants made of high quality, supportive material that will carry you through every downward dog. You can’t go wrong with these Disney Inspired Rafiki Wise Baboon Yoga Leggings. Sophisticated styling combined with a soft, stretch performance knit — and you have the winning combo for the most comfortable pants you’ve ever worn. Available in all sizes, these leggings truly keep their shape, wear after wear. Our Rainbow Colored Leggings make the most playful yoga pants you’ve ever seen. The cool mermaid print and use of colors can help keep your yoga practice feel fun and light. 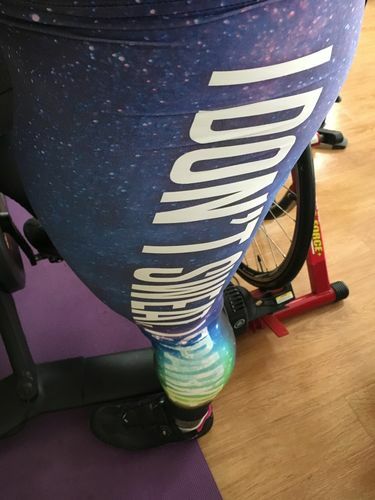 Channel your inner diva with ‘I Don’t Sweat, I Sparkle Workout Leggings’. You will surely add flair and fun to any yoga class with these bright and sassy leggings that look cute, but are also designed to enhance your performance. These Lion Yoga pants are made to feel just like a second skin. Throwing an animal print into your yoga outfit or everyday ensemble is a great way to show off your fierce self and sassy personality, while creating a bold and eye-catching look. Endless styling options are possible, and whatever you go for, know that the Lion Leggings are just made for you to look fabulous. Our Angel Wing Leggings are perfect for a variety of sports — not just yoga. You will fall in love with the comfy fit, soft fabric, the print, and the seams that flatter for days, whether you’ve headed to yoga, barre, fitness or Pilates.